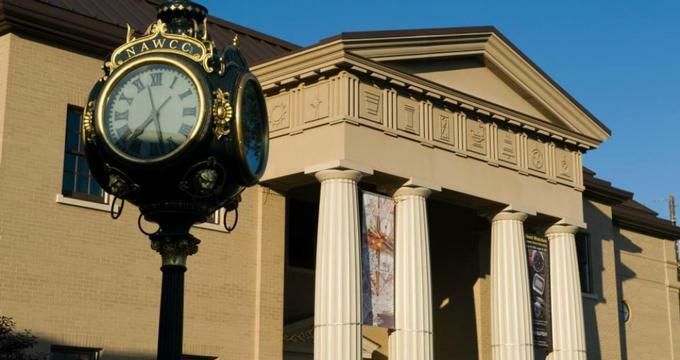 Located in Columbia, Pennsylvania, the National Watch and Clock Museum aims to educate visitors about a wide variety of historical watches and clocks while inspiring a passion for timekeeping and timepieces. Visitors of all ages will be delighted by timepieces from all over the world in expertly designed exhibitions and can attend a wide variety of educational programs and family-friendly community events and workshops. The National Watch and Clock Museum was opened to the public in 1977 and at that time, the museum only had about 1,000 items to display. Since its first opening, the museum has since grown its collection to more than 12,000 historical and cultural timekeeping items and has also expanded its gallery and exhibition space quite substantially. The most recent expansion took place in 1999 when the museum added an entire story to its building – more than doubling its exhibition space! Now that there is plenty of room, the museum currently houses the largest collection of 19th-century American watches and clocks. The galleries are arranged chronologically through the entire history of watches, clocks, and timekeeping technology starting in the time of non-mechanical devices all the way up to modern day atomic and radio-controlled timepieces. There are a variety of timepiece collections from all over the world including pieces from 19th century America. The collection also includes English tall case clocks and timepieces from Japan, China, Germany, Russia, France, and the Netherlands. Watch Portraits by Atom Moore: This exhibition features the photography of world-renowned artist, Atom Moore. His collection is entitled Watch Portraits and displays some of the finest details and aspects of both vintage and modern timepieces. The exhibition features macro shots which show the subtle beauty of many pieces, and mashups which show these features in a collage of repetition. The exhibition is on display at the museum until December 31, 2017. Art of Time:This special exhibition showcases the works from artists all over the world who used time or timepieces in their works of art. Everything from surrealist paintings to sculptures are on display, which will delight visitors of all artistic preferences. The exhibition is on display until January 2018. James Bond Wore the Quartz Revolution: This exhibition displays the timepieces that were worn by the famous super spy, James Bond, during the James Bond films from 1973 to 1995. Visitors can get up-close-and-personal with the famous wristwatches and this exhibit is sure to delight all James Bond fans. The exhibit was opened in the summer of 2015 and is still on display. Sponsor’s Hops’n’Clocks:The annual event of the season, Hops’n’Clocks, will be on July 7, 2017 this year. Local restaurants and microbreweries have the chance to gather and pair their specialties for an evening of great food, beer, and clocks. Local companies are invited to attend by simply sponsoring the event and enjoying the entertainment and subsequent advertising! For more information on becoming a sponsor or attending the event, please visit the website or send an email to Gillian Radel at gradel@nawcc.org. Because education is part of the core mission of the museum, there are a variety of educational programs and activities for members of the entire family available year-round. Everything from local activities to full-blown national events, there are all kinds of workshops, interactive activities, and educational opportunities at the research center and library. One of the most popular workshops is the opportunity to learn how to care for your timepieces. These classes aim to increase attendees’ knowledge about clocks as well as how to care for and repair them on their own. Be sure to visit the website for more information about educational programs at the museum.